IRVINE, Calif.–(BUSINESS WIRE)–CoreLogic® (NYSE: CLGX), a leading global property information, analytics and data-enabled solutions provider, today announced updated residential and commercial storm surge and wind loss estimates for Hurricane Michael. According to this new data analysis, the wind losses for residential and commercial properties in Florida are expected to be between $2 billion and $3 billion, and the storm surge losses, including losses covered by National Flood Insurance Program (NFIP), are expected to be an additional $0.5 billion to $1 billion. Our analysis accounts for insured losses. The post-landfall estimates below have been updated based on the October 11, 11:00 a.m. EDT National Hurricane Center (NHC) advisory of the storm. At this time, it is unlikely that inland flooding will be a major contributor to loss totals, but CoreLogic will continue to evaluate this as the storm unfolds. 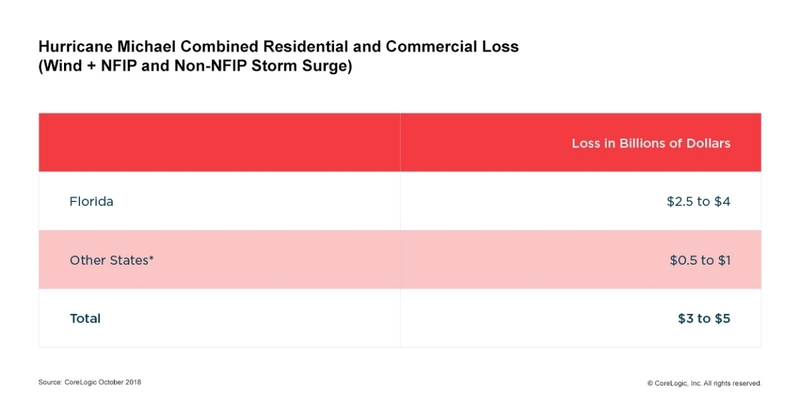 This analysis includes residential homes and commercial properties, including contents and business interruption and does not include broader economic loss from the storm.